Nowadays, it seems everywhere you look, style stars are piling on the arm candy — bangles and friendship bracelets are weighing down the arms of fashion mavens left and right. 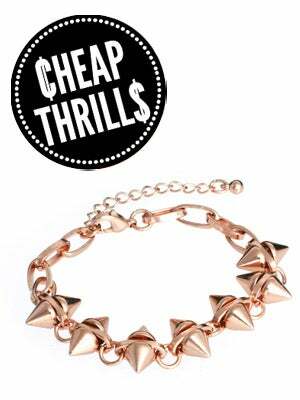 Instead, break out of the bracelet mold with this double-spiked chain from ASOS. The edgy shape gives it a cool-kid vibe, but the delicate size means you can sport it with a sundress, or at the office. And, the icing on the (bauble) cake? This gold number goes for under 10 big ones, which means you have permission to buy a whole stack, and start your own kind of arm party. ASOS Double Spike Bracelet, $9.94, available at ASOS.